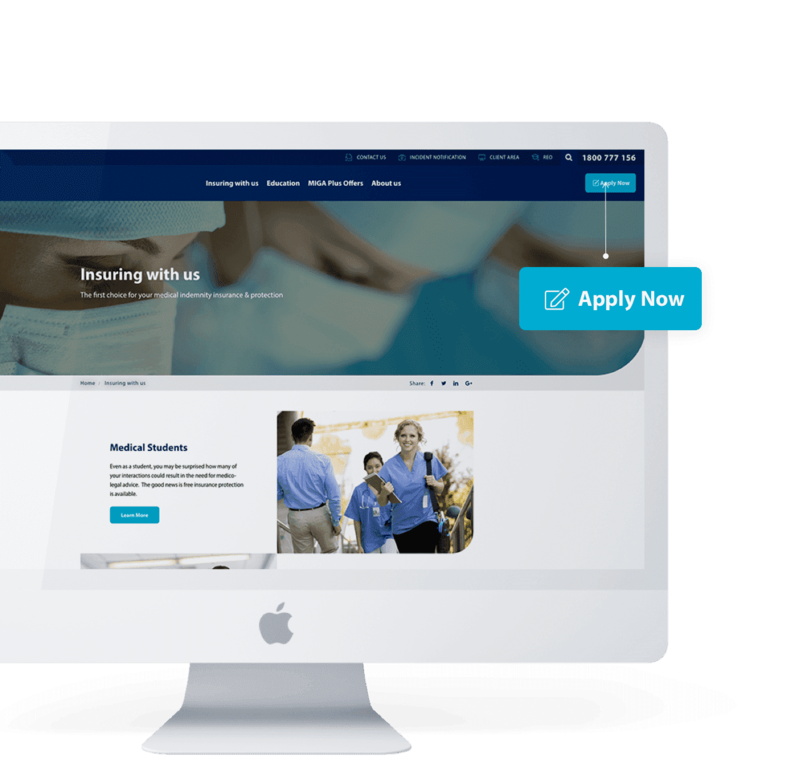 Redeveloped website for Australia’s medical indemnity insurance experts with 115 years of experience. Achieve growth and upkeep high retention rates from their existing client base, in order to strengthen their position by covering a greater share of the national medical indemnity insurance market. Diversify their client base through extending their PI/Med Indemnity insurance products to other health care professionals and offering other insurance products and services to members and clients via partnership arrangements. Retain and attract well qualified staff through a commitment to their personal and professional development, conditions of work, work-life balance and training. Invest in technology – With a focus on the smart use of technology, improved processes and innovation. 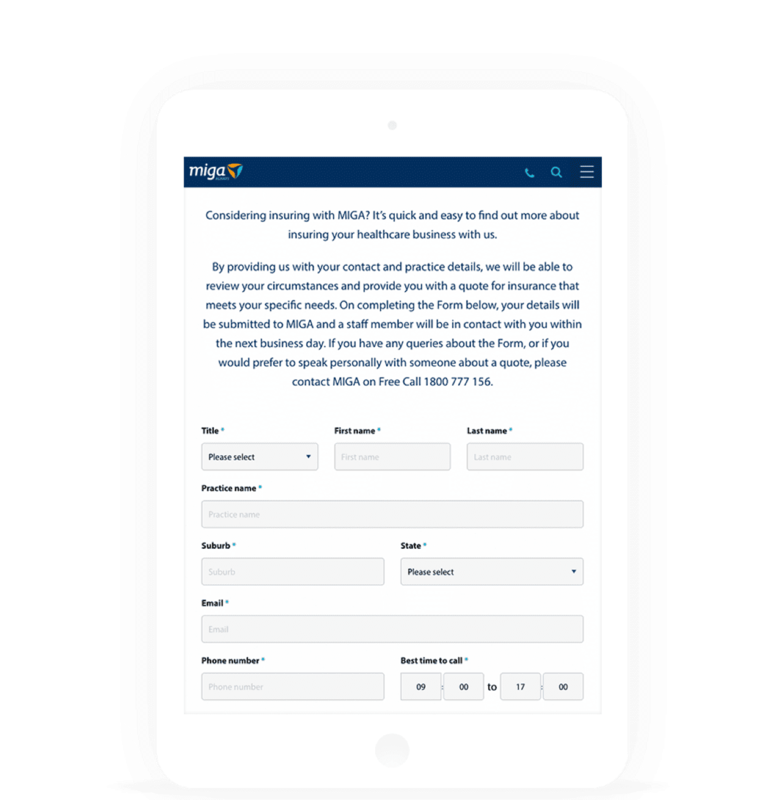 One of the key solution challenges was the provision of higher conversions needed from quote request forms, and the integration of these forms seamlessly into the website. Tighter integration with iBAIS, MIGA’s chosen insurance admin system, was also of key importance to facilitate online Policy Renewal Payments. However, no existing API was available for iBAIS, meaning the development of several customised interfaces would be required. Finally, the new website project had to be completed and deployed within a short 12 week timeframe. The Digital Embassy team used behavourial analytics supported by stakeholder feedback to develop streamlined user journeys, tailored to the needs of specific audience types. This culminated well placed Calls to Action to drive strong lead generation. A rich content strategy supporting a multichannel content structure was enabled to increase brand awareness and familiarity, while presenting user groups with the most relevant content. The new MIGA website would deliver targeted content via the adoption of a series of landing pages. This approach would provide visitors with the most meaning and relevant information about products and services which best met their needs. Users could also view more detailed information, read case studies, apply online or contact MIGA directly through simple Calls to Action. In addition to improving audience engagement, the landing pages would also serve as a key part of any search engine strategy (SEO / SEM) MIGA planned to undertake. As an extension of the content strategy, elements would be designed to facilitate the acquisition of qualified staff to the business. These elements include the creation of content features and interactions that would harnesses the core tonality elements that are associated with MIGA, like caring and sincerity, and reiterate their values and brand identity to potential staff. New online functionality would also allow MIGA to easily present and manage job opportunities on their website. Other revenue generating features of the new MIGA website include product and service promotions and cross channel promotions, which direct users towards follow up interactions. The ability of the new MIGA website to support its business and client growth objectives through the adption of smart technologies would be delivered through the integration of iBAIS with Kentico’s ASP.NET EMS platform. An online renewal invitation process where the MIGA member is provided the opportunity of updating key membership information as part of the policy renewal cycle. The ability to book into various events and conferences that MIGA conduct. The ability to undertake Risk Management questionnaires and quizzes that are keyed to the member type and which feed into the renewal rating process via discount calculations based on results achieved in the quizzes. 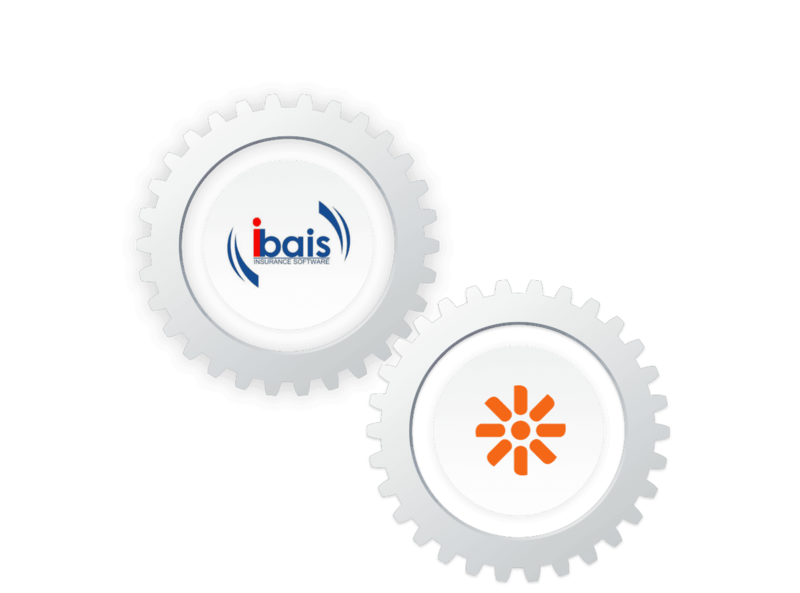 Due to the absence of an API, optimal integration with iBAIS was achieved through the development of customised interfaces. To do this, an assessment was made as to how much integration could be done to the interface with iBAIS for the initial website launch. The intention being that this integration would evolve with subsequent website enhancement phases. The Digital Embassy identified Kentico EMS as the CMS platform of choice for the MIGA website. Kentico EMS is an enterprise grade CMS that provides powerful features around content personalisation that set it apart. The platform is able to monitor user behaviour on the site and present relevant content that will dynamically reflect their demographic. In the event that they provide details through completing a CTA, Kentico can profile that user automatically for future communications. An example is the ability to segment this user type automatically for email campaigns, which are a Kentico feature. Another is the ability for a MIGA representative to understand the user’s interests before a phone call is made to discuss membership. Kentico also has a powerful workflow engine that can be used to trigger automation and notifications. This workflow engine also automates the approval process for creation and update of all digital content (web, social, print media). Kentico’s Online Marketing solution, which offers Email Marketing, Lead Scoring, Marketing Automation, and more, helps nurture leads, analyse and optimise campaigns to turn prospects into customers and increase brand advocacy. By leveraging its Personalization and A/B Testing capabilities throughout the customer journey, conversion rates increase from lead generation activities to deliver high-quality leads. 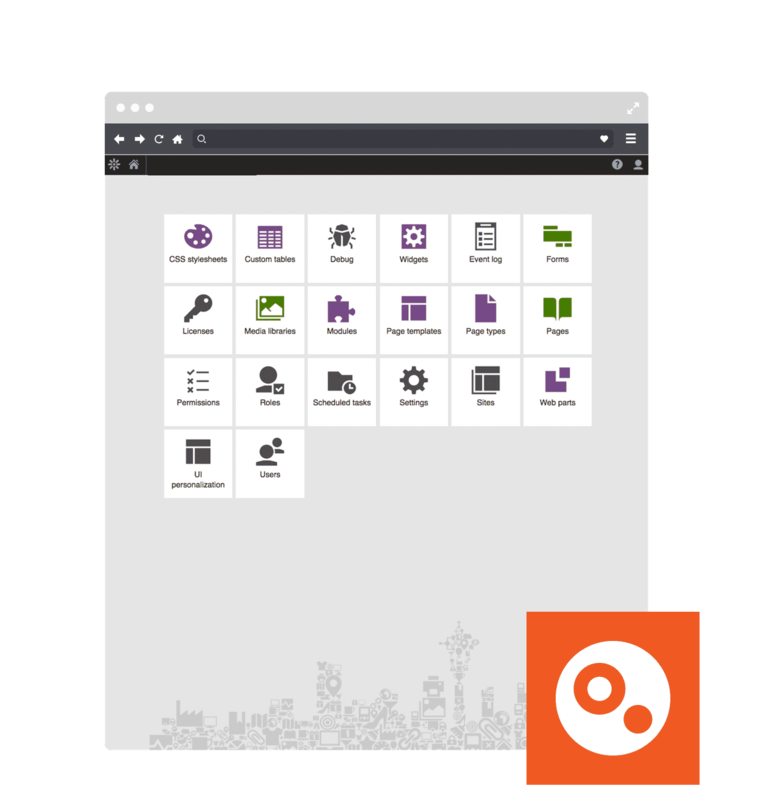 The built-in Integration Bus module, which comes with the Kentico platform, allows easy integration with third-party systems. It allows any number of connectors to be set up, which work with any number of external systems and manage the integration from a single point. Users can be authenticated using systems such as .NET Forms or Windows Authentication, Facebook, LinkedIn, Live ID, and OpenID account, or integrated with a customised user database or authentication service. MIGA internal systems such as iBAIS are now much more tightly integrated with the new MIGA website to provide a more seamless user experience. Improvements to the website accessibility, interface design, architecture and iBAIS system integration will enable MIGA to initiate and enhance business activities that drive customer acquisition and growth targets while also providing operational efficiencies and cost saving through the streamlining of manual processes. 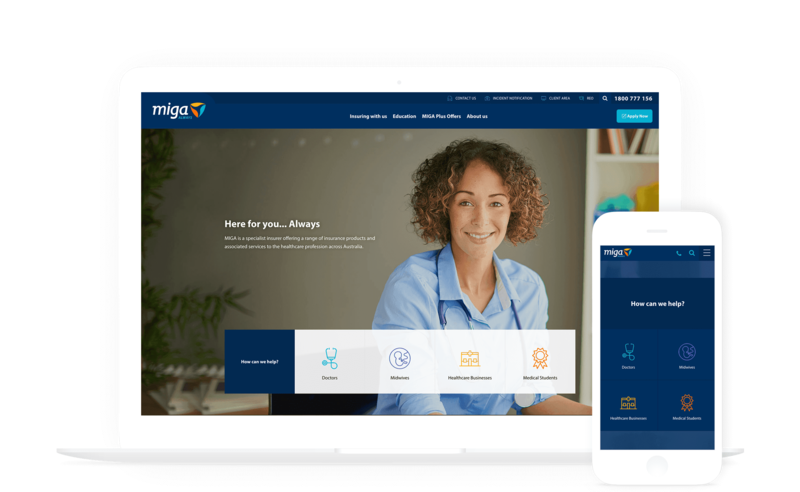 The use of the Kentico EMS supports future marketing and smart technologies integration such as persona personalisation of MIGA’s website and CRM integration. Existing member retention has been improved through the provision of better communications, products and online facilities via the website. The website simplifies the way MIGA’s members pay and transact, receive information, lodge claims, conduct risk management education and update their details.